The Document and Change Control module is a Master List of all controlled information. With it, you can manage document changes and ensure that all changes are authorized and recorded. The Document and Change Control module goes beyond documents alone. Instead, it becomes a Master List for any type of data. Think of it as an “electronic catalog” used to organize, manage and control changes (revision control, version control) to any type of information important to your business. 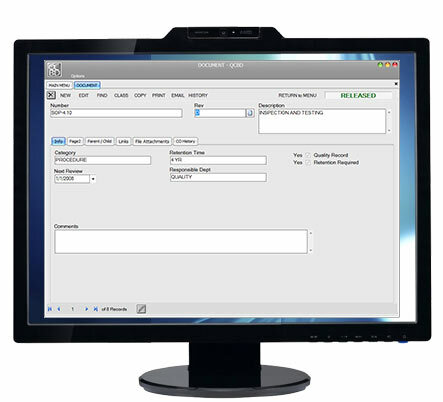 Designed specifically to meet all the requirements of a fully functional document control system as described by quality standards such as ISO 9001, ISO 13485, AS9100, TS 16949 and SQF 2000 / ISO 22000. QCBD is fully compliant to 21 CFR Part 11 (Electronic Records and Electronic Signature). QCBD can handle the full range of document types, enabling you to organize and cross reference your information and provide access to that information over a company network while enforcing security and control. DASHBOARD VIEW – Users can view and respond to all open action items with the click of a mouse. LINK RELATED DOCUMENTS – Link documents to one another in a parent / child hierarchy (like a ‘Bill of Material’ listing). With Master List linking, records at the top of the hierarchy can function as Master Records or Master Device Files. AUTOMATIC EMAIL NOTIFICATION – Automatically notify users by email when they have been assigned as an approver. All Change Order notifications can be distributed by email from inside QCBD. ATTACHMENTS – Attach the actual document files which you want to manage and control. Documents reside within a secured location and are available for viewing and printing. All file types are supported. USER ASSIGNED SECURITY – You have full control over who can view, create and change documents. Assign access to each user separately, from the lowest read-only privileges to highest full supervisor rights. DOCUMENT CHECK OUT/IN – To make changes, users must check out documents. CUSTOMIZE – Customize the Master List user form to show the information relevant to your business. Create separate ‘item types’ (subclasses) with different properties and behavior. You can even designate item types that require revision control (use change control) or items which do not. FIND INFORMATION – Quickly find documents and other master list records. You can sort, filter and group information quickly. Preconfigured queries help you quickly locate documents with pending changes and document changes waiting for your approval. ELECTRONIC SIGNATURE – Route and approve changes electronically. Multiple approvers can review and approve document change concurrently, dramatically reducing the approval cycle type. E-Signatures permit you to store records online and go completely paperless. FLEXIBLE VERSION CONTROL – Enable version control to ensure the appropriate level of change control for your documents. AUDIT TRAIL – Have instant access to a complete change history with the click of a mouse. Track all changes over the entire document lifecycle. LINK DOCUMENTS TO TRAINING – When procedures are changed, affected users are notified by email that training is required. TRAINING – Integration with other QCBD modules enables you to link training requirements to document changes. When document changes are released, users are automatically notified by email that training is required. The Document and Change Control module is a Master List of all controlled information. Think of it as an “electronic catalog” used to organize, manage and control changes (revision control, version control) to any type of information important to your business. Your documents are placed in the file attachment section in their native format (Word, Excel, PDF, etc.). Organize your documents by category. Security access determines which users can view documents and who can make changes.